Regarded as the greatest English potter of his century, Josiah Wedgwood (1730-95) opened his factory in Burslem, Staffordshire, in 1759. What marked his progress towards ever-increasing success was a process of ceaseless technical and stylistic experimentation. He was tireless in developing new ceramic bodies and was responsible for introducing the neoclassical style into English ceramics. 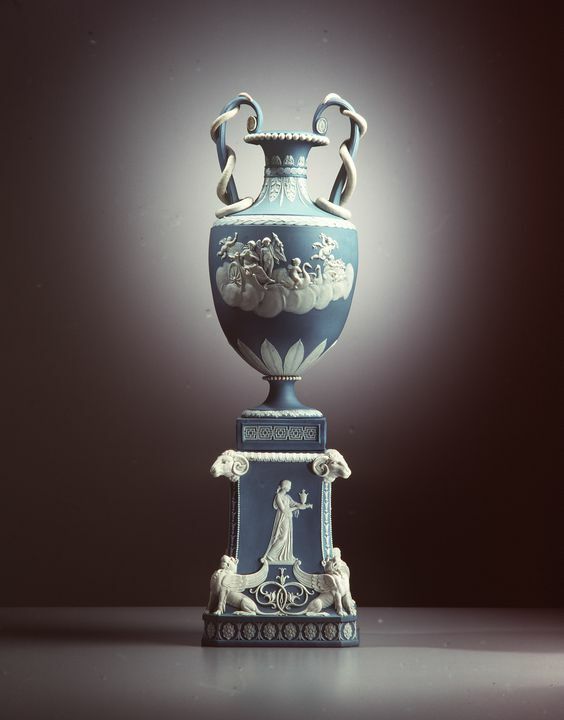 Pale blue Jasperware vase and pedestal base with white relief. Decorated with white relief depicting Venus in her chariot surrounded by cherubs. The high, scrolled handles are wrapped with serpent figures in white. Base is decorated with white relief depicting Venus with rams head and phoenix figures.